“3rd time is a charm” or at least that is what I was hoping for this year as I registered for the Titletown Ultra Series. 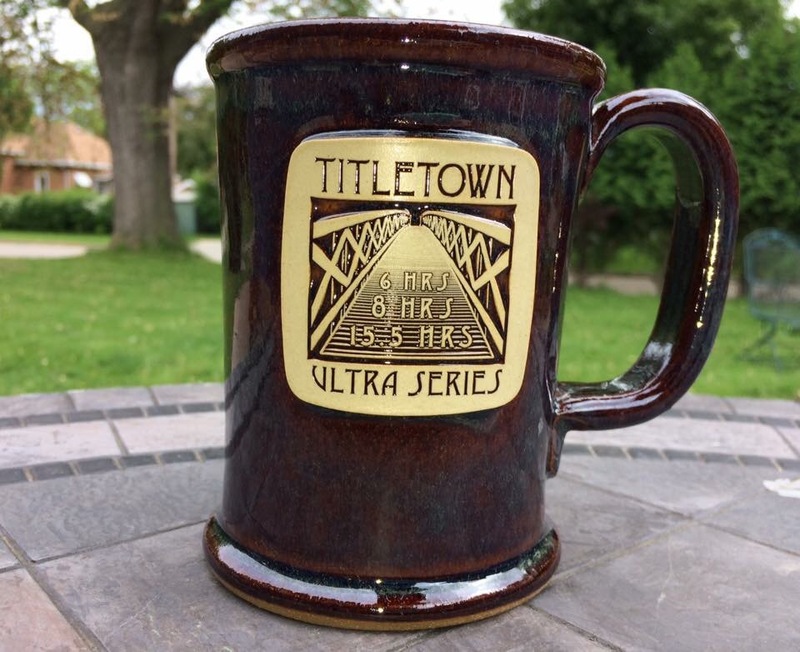 3 years ago Titletown was my 1st ultra distance event. That year I ran 28 miles in 6 hours and proudly entered in the ultra club…to say I was hooked was an understatement. I loved the event so much that I ran it again the following year and added more miles in the 6 hour event. You cannot beat an event that is close to home, is a beautiful course, and has the most amazing people at it. To be honest I doubted that the 50 mile distance was for me. After Zumbro I was beginning to believe that I had hit my threshold or “wall”. I love the 50k distance. It takes a great deal of training and is a challenge for me. Was that my peak distance? Deep down I knew the answers to my questions. The thing is I always have. 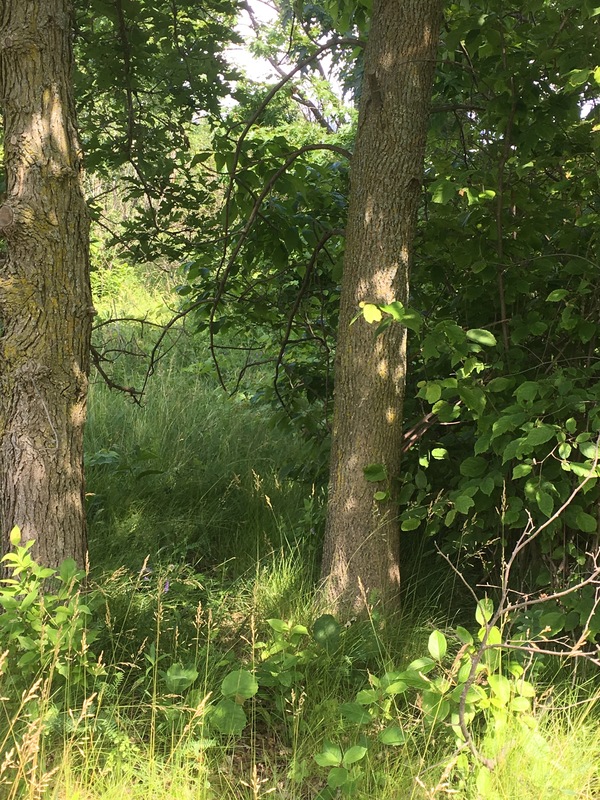 As the miles piled up at Titletown I finally let my mind and heart open up to answer them…it was time for me to get real with myself and find peace in my running journey. Does this sound corny…yes, but for me running is the time I tackle tough personal issues. What I recognized at Titletown was that mile 40 was not my downfall my fear was. I was afraid I was not tough enough, strong enough, trained enough…just plain enough. F-that! I had done this before, was it going to hurt at some point – duh, the answer to that was “yes” but I could handle it. The truth is I don’t trust myself and when push comes to shove I would rather check out than step up. At both the Fall 50 and Zumbro when it hurt and I was tired I checked out, I gave up on myself, I let the doubt take me to a deep dark place. Looking back I needed to get there and be in that dark place to prove to myself that I could dig out and step up. It is time for me to acknowledge that I have weaknesses, but also I have strength. I’ll be the 1st to pile on myself, but the last person to stick up for myself. Thank you running for giving me the opportunity to have this conversation (mind you, in my head). Back to the race! At 5:08am sharp we started. I love the laid back way this race begins. A few words from the race directors, Ann & Scott, then off we went. 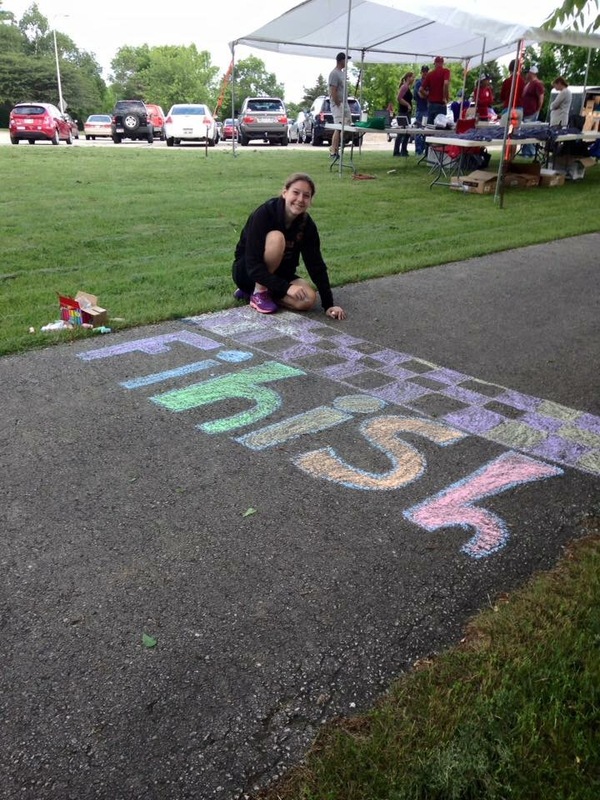 The start/finish line is hand drawn on the concrete with chalk that adds to the playful feel. At start/finish line base camp is set up. This main aid station was fully stocked with fluids, food, massage center, ice bath, official gun time clock, volunteers, and places for runners to set up their personal items for the race. A few feet from the tents at base camp I set up my spot were I worked from throughout the race. Each loop was 4.75 miles. From base camp to the 1st aid station there was a combination of paved path (only a few feet), a road crossing, gravel path, and bridge. The variety of surfaces keeps you on your toes and focused, so much so the 1st aid station sort of pops up before you realize it. The views of the bay are beautiful and the breeze off the water refreshing. Aid station #1 included full fluids, food, watermelon, and a port-a-potty. From AS #1 you head down a short paved path to gravel and then the fun begins! This portion tends to be challenging. 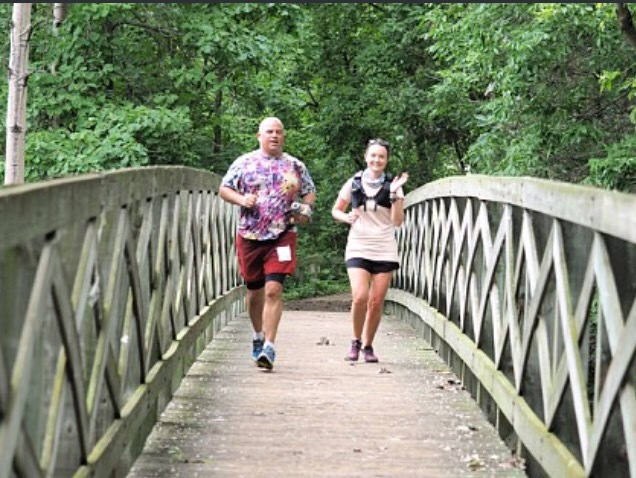 There are wooden bridges, roots, hills, wood chips, gravel, mud…all the best parts of trail running. Even after 10 loops I looked forward to this section. It is the BEST! Aid station #2 was located at the end of the prairie-ish section of the course and welcomed relief from the open area. This station was also fully loaded with everything you could possibly want as a runner including ice buckets with towels. After leaving out of AS #2 you turn a corner and head up a size able hill. This portion of the course feels like an enchanted forest and very different than the other portions of the course. The terrain is dirt/mud/woodchips with a few roots and rocks to work around. It is beautiful and green with tons of foliage to cover and cool the trail off. From AS #2 back to base camp there is approximately 2.2 miles. 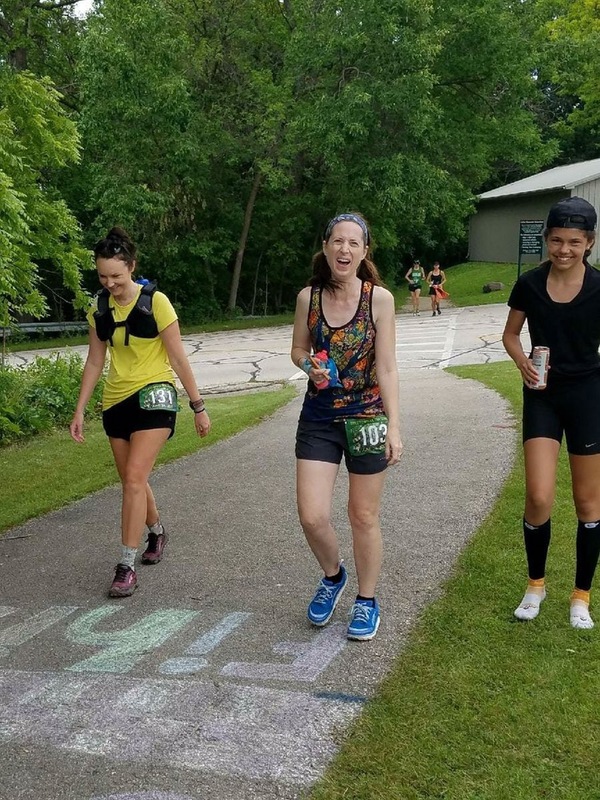 The last stretch of this section you run next to Shorewood golf course and crossed the famed bridge that is the moniker of the Titletown Ultra Series. When I mentioned to friends that I would be running this event the 1st question I got from many was…”Won’t you get bored?”. Yes you will run loop after loop on this course, but you will be far from bored. One, the course is beautiful. Two, being that it is 4.75 miles the field stretches out quickly and you run with a variety of individuals throughout the day. Third, the volunteers are amazing and make the time fly by getting you from station to station. So…nope, not bored at all. Despite my hesitation to sign up for and attempt to run another 50 mile event I decided to give the 15.5 hour a try at Titletown. My goal going in was to run until I finished 50 miles or things went sideways. I fully expected this to be tough, difficult experience like my other 50 milers. We started, loop 1 down, loop 2 down, loop 3 down…then the rain started. Loop 4 and 5 soaked to the bone, but still felt good. I was drinking and eating on a 45 minute schedule. My goal was to get the calories in before I started to feel like vomiting like I had in my previous races. I never felt awful. My stomach never revolted. I changed things up a bit for this event. After doing many hours of research I found that caffeine may be the root of my GI problems. So the game plan going in was to start with 2 pieces of Run Gum and then not ingest caffeine until the last 2 loops. I stuck to this plan and it worked for me. I did feel a dip in my energy around mile 35 so I opened up my secret stash of Swedish Fish and grabbed a handful. The sugar bounced me back and helped me feel back on top of my run game. Loop 6 through loop 10 were a blast. I had fun, laughed, ran, walked, chatted with other runners. Mile 40 was no big deal! It did not take me down, force me into a place of rawness as it had before. I stayed in control mentally throughout this race and did not let the issues that popped up take me down as they had in the past. I’m not a flexible person my nature, but in running that does not work. You have to work the problems and issues that arise or they will rule your race. At mile 48 I realized I had an opportunity to finish my 50 mile in 12 hours. This to me felt like redemption from Zumbro, which took me 17+ hours. Time to buck up and get moving. With all that I had I pushed and ran as hard as I could for 2 miles. I reached the AS #3 (which was the 50 mile point) in 12:03!!! This was huge for me and a major breakthrough. I took my hydration pack off and in my mind I was DONE. I chatted and laughed with the AS volunteers, did a Fireball shot, and relaxed for a few minutes. A fellow runner came into the station while I waited for a ride back to the start and talked me into finishing the loop to round out my race. I threw my pack back on and headed out with him. Boy am I glad that I did! It felt good to cross the finish line and complete that loop. 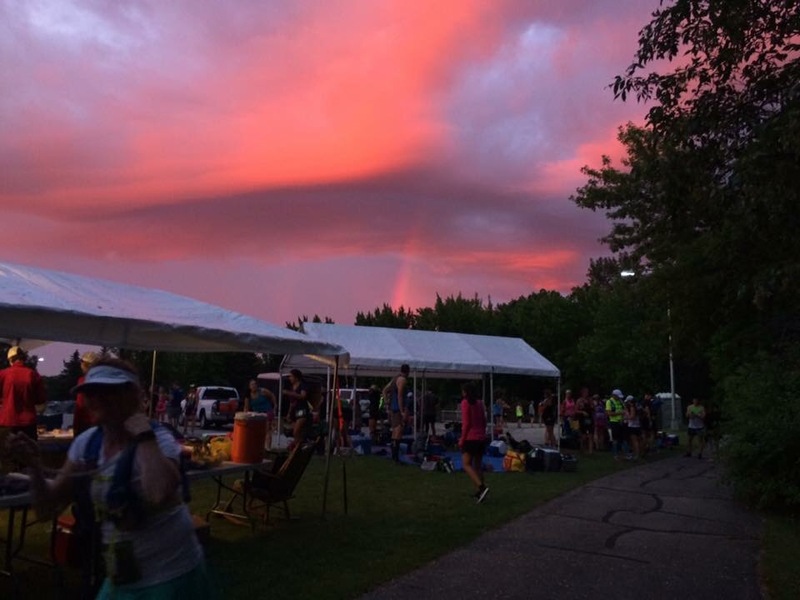 In total I ran 52.2 miles – BEST DAY EVER! 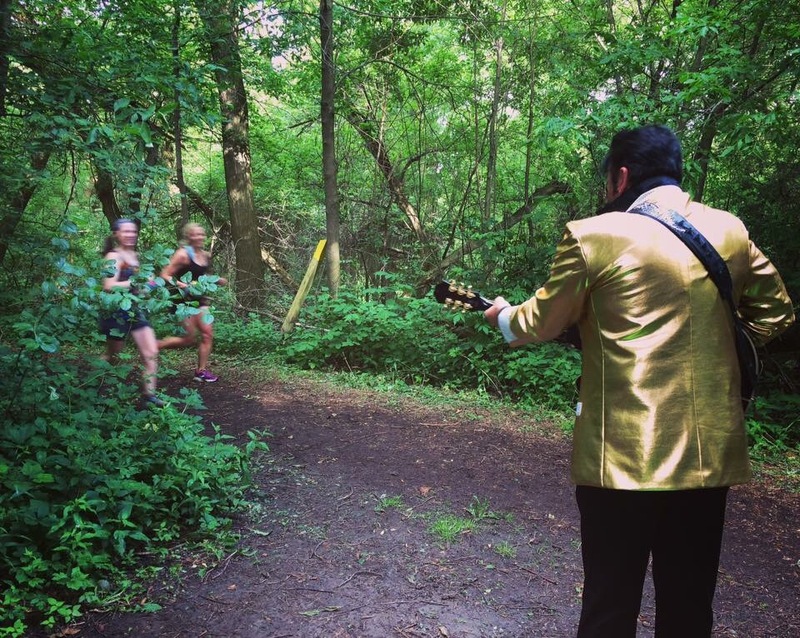 I got to spend the day with the most wonderful people including my fellow Oiselle teammates, the Ten Junk Miles crew, and Elvis. Some runners I have had the awesome luck to have run with in the past, others I met on the course for the first time – all are now part of my story and forever in my memory. Running isn’t about one race for me, it is a collection of experiences that I take with me to my next adventure. I’m a better runner and person as a result. 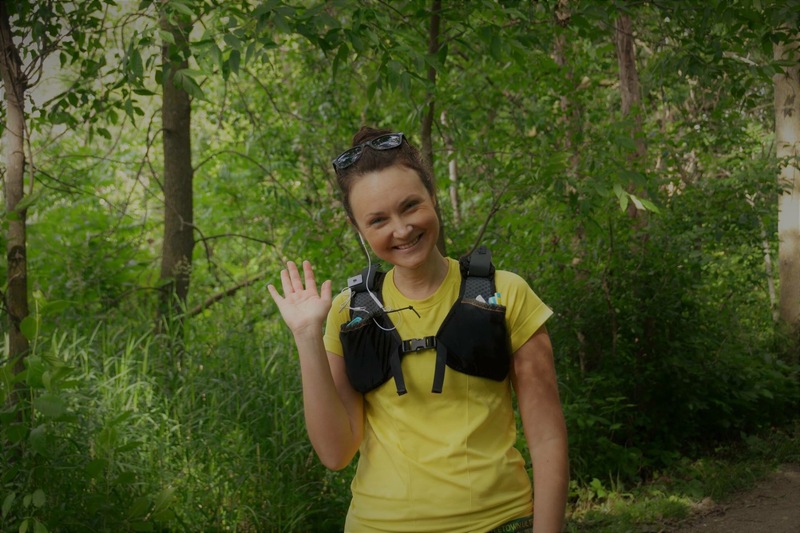 Orange Mud HydraQuiver VP1 – This has become my go-to race pack. It fits like a glove and allows me to carry everything I need. With my asthma flaring again having the confidence of my inhaler in the front pocket and easy to reach I can run confidently. Tailwind Nutrition – I filled my bottle with 2 scoops of Berry with 24oz of water. I had 3 bottles pre-filled at base camp that I could easily grab when needed and reduce my aid station time. I switched to Tropical Buzz (caffeine) on loop 9 of 11 for a little boost. Oiselle – The temps were in the low 60s to start with a prediction of rain (which cam true). I started with black Distance shorts (no worries of see through when wet from the rain), Imuzo short sleeve, and Volee Verrazano sports bra. Run Gum – I popped this in about 30 minutes before the start of the race at 5:08 am. I was tired and need to get my head in the game. Trail Toes Cream – I slather this stuff on before I put my socks on to prevent hot spots and repeated with every sock change at base camp. It rained throughout the race…reapplying was a must to prevent blisters. I love that this product can go on wet surfaces, that is not the case with other lubes that I have tried. Salt Stick Caps – I followed my regular schedule of 2 per hour to prevent cramping worked great. The temps ranged from mid 60s to start and peaked around 80. Pure perfection! Altra Superior 3.0 – Race number 3 for these shoes. They worked awesome at Zumbro in the sand and Apple Creek in the mud, I was hoping they would also combat the fresh wood chips that are typical at Titletown. The course was not as technical as some trails I have run, but did have slippery spots due to the rain. The shoes gripped and gave me the control I was looking for. Picky Bars – I ate 1/2 a bar (Need for Seed is my FAVORITE) every 45 minutes in addition to Tailwind. My energy level stayed consistent and stomach did not get upset. I felt so darn good…huge win for me. Thank you to Coach Nora Bird for guiding me through all the ups and downs to get to this point. The journey to conquer 50 miles has not been smooth, but you never stopped believing that it was possible. 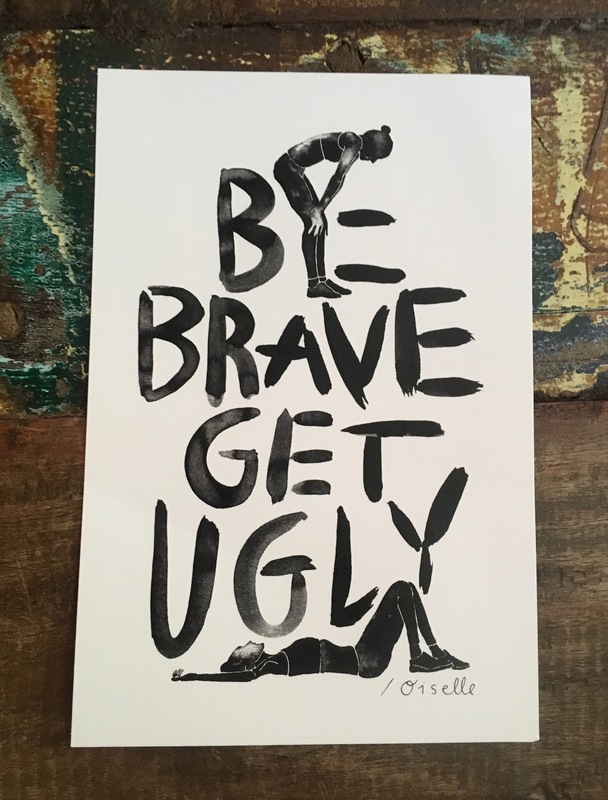 Trust me there were many times I was ready to give up and settle for what felt comfortable, you were patient as I worked through those emotions and doubts – for that I am grateful. Peeps if you are looking for a running coach she is you girl, check her out at Team Bird Training! Great job and a great read! !